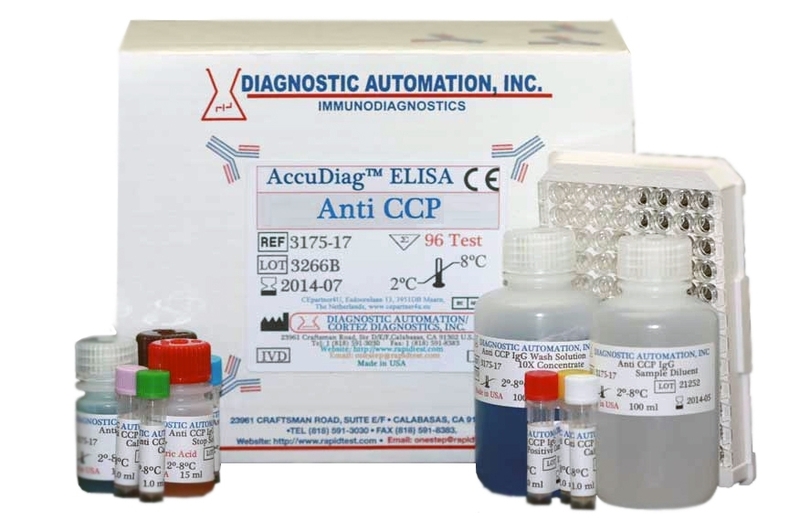 Diagnostic Automation Inc. offers Anti-CCP ELISA test kit which is an indirect solid-phase enzyme immunometric assay for the quantitative determination of IgG class antibodies directed against Cyclic Citrullinated Peptides (CCP), present in human serum or plasma. Anti-CCP test is based on the binding of the antibodies present in the sample, to the antigen coated on the microplate. Rheumatoid arthritis (RA) is one of the most common autoimmune diseases in European population. The most significant clinical symptom is an inflammation of the synovial membranes which causes a painful swelling of the articulations and ankylosis. Abnormal antibodies (immune proteins) are found in the blood of patients with RA. An antibody called Rheumatoid Factor (RF) can be detected in 80% of patients with RA. Another antibody which is present in the blood of most RA patients is Citrulline antibody which is also known as anticitrulline antibody, anticyclic citrullinated peptide antibody, and anti-CCP are associated with more aggressive forms of RA. The advantage of the Anti CCP antibodies is that they are detectable in the patient sera up to 10 years prior to the appearance of symptoms and are characterized by a specificity of over 90%-95% in patients affected by RA. Moreover, the presence of Anti CCP antibodies can be used in the diagnosis of juvenile RA. The Anti CCP antibodies test has an important prognostic value in the monitoring of articular radiologically detectable damage. The kits quantitative determination is useful in the control and verification of the effects of pharmacological therapy. The Anti CCP antibody test, together with the determination of RF increases the ratio of sensitivity/specificity. 20% of the RAs are RF-negative and 15/20% of the RAs are positive only to RF. The simultaneous positive result of a sample to RF and CCP has a positive predictive value of about 100%. 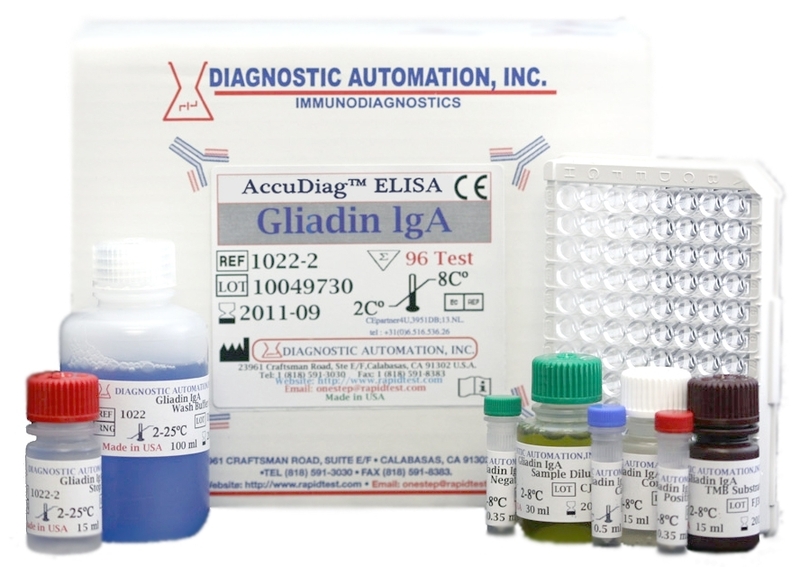 The Anti-CCP IgG ELISA kit, like many ELISA KITS, is for in-vitro diagnostic & laboratory use only. See the Anti-CCP IgG ELISA kit product insert for details on preparation, procedures, quality control, and test result interpretation. 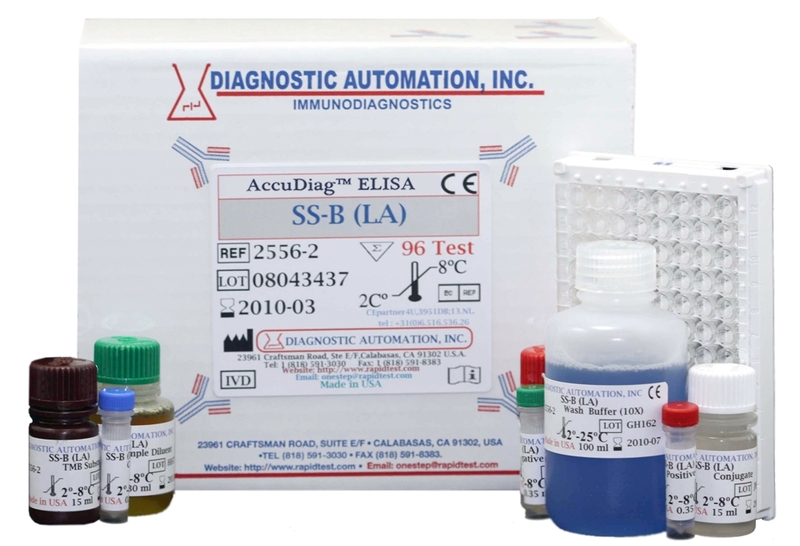 Diagnostic Automation Inc. also provides other Autoimmune ELISA Kits. 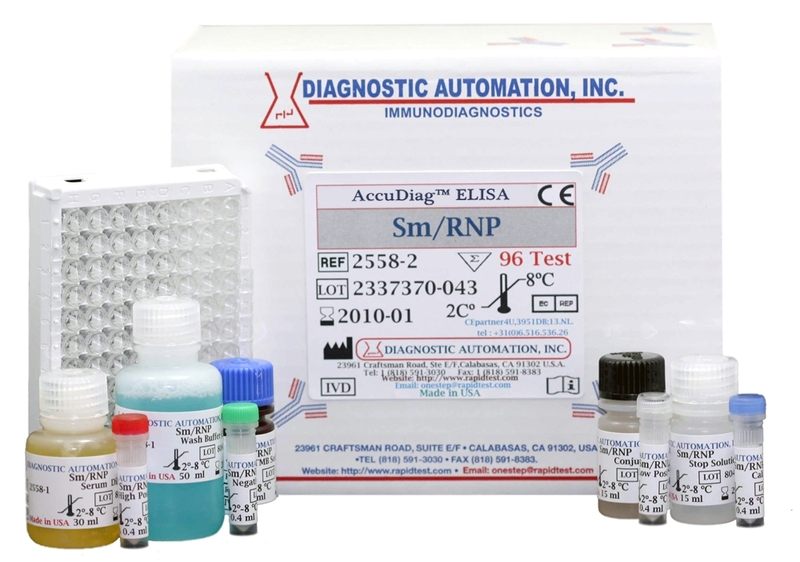 For more information about these ELISA Kits or Rapid Test, IFA Kit, CLIA Test Kit, or Serology test, please see our website home page, or contact our Customer Service Representative at 818-591-3030.